Folks have been cancelling Yeezus left and right and posting fake obits for the man who used to be known as Kanye "George Bush doesn't like black people" West. That still may be the case even after his new 'love" focused tracks he just dropped. It's publicity stunt-tasticness at its finest. We're just shocked so many aren't seeing through what we've seen through since the day he married into the family who re-invented publicity stunt-ery. They do it so well, people actually believe that their (this now includes Kanye) way of thinking is "genius". Just in time for his new album and new book to be released, Kanye's back on Twitter. And he's in rare, reckless and problematic form. The internets are blasting #KanyeWest for publicly praising alt-right supporter/anti black lives matter “personality” #CandaceOwens. Plenty are calling him out for being controversial just to be controversial and taking a hypocritical stance - considering his Usual beliefs - to sell his clothes, shoes and albums. He masked his support as “loving the way independent thinkers think”, despite the fact conspiracy theorists who use fear mongering and hate against their own people are far from independent thinkers. 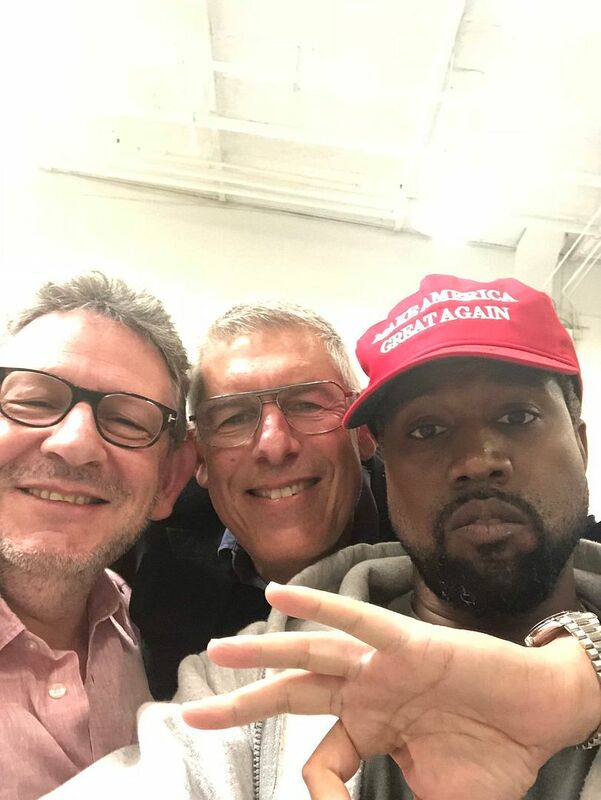 Kanye's gone from praising Trump and black alt-right conservative foolywangery Candace Owens to rocking the red MAGA hat and trolling folks' timelines. He claims he "doesn't know enough" about the party to call himself a conservative, but he's all about "free thinking". Who's going to tell him supporting a man who literally calls entire races and groups murderers, rapists and "my black" is the opposite of expressing "free thought"? Kaye's been exhausting us for days, and now he's putting out more bait for folks to chew on. 'Ye tried to pop back at all the folks - not just black folks either - who told him he's turning his back on the culture who put him on a pedestal and supporting a man who hates them. He stated President Obama - who once called Kanye a jackass - did nothing for Chicago after being President for 8 years. He exchanged tweets with conservatives AND Trump about running for office himself and "leading the black community" and more. He did everything but say what HE has done for Chicago himself the last decade he's been one of the kings of the rap game. Celebs, including his wife, are chiming in about #KanyeWest. The Chicago native got all the praise from Trump croonies and supporters for "smartening up" to Trump's way of thinking. He never corrected them about where he stands. Only doubled down on "not following group thought." So Trump is the hill you want to die on, 'Ye? Let's not do this. Now, in addition to announcing a conveniently timed plan to give back to his hometown, he dropped new music late last night to accompany his thirst-driven return to Twitter. Of course. He's been going at it with Hot 97's Ebro Darden after Ebro told the world about his off-air convo with Kanye. 'Ye apparently told the radio host that nobody had his back when he was getting help for opiod addiction and emotional disorders. Maybe it's because him and his Kardashian Klan told the world he was just "exhausted." Kanye praising Ebro's rival Charlamagne Tha God wasn't enough revenge, so he responded with a song about "love." It's mostly gibberish, but we're sure his stans will call it genius. It's called "Lift Yourself," and it has lines like, “poop de scoop whoopity scoop diddy scoop poop." #TI says he’s not giving up on #KanyeWest. Today, he put his political arguments with T.I. on wax. T.I. spoke up a few days ago about seeing Kanye. We guess this was why. #JohnLegend also texted #KanyeWest about his irresponsible tweets (see previous post), and Kanye says folks don’t think of empathy when thinking of MAGA. Why would we? Kanye firing most of his employees who don't see his "vision", his managers, his lawyers, and team and hired only full time lawyers because he's no one's "client"), wasn't the oddest thing he's done this week. Neither was him threatening media publications or inviting TMZ over to freestyle for them in order to prove he's not acting "erratically" or fighting with Kris Jenner as rumored. Kanye's latest shock-and-awe Twitter announcement had folks shaking their head in "I knew it" type sadness. It's no surprise Yeezy's been harboring unresolved feelings about his mother's death, which is what most people attribute his erratic behavior over the years to. Could this be the signal everyone was on to something?